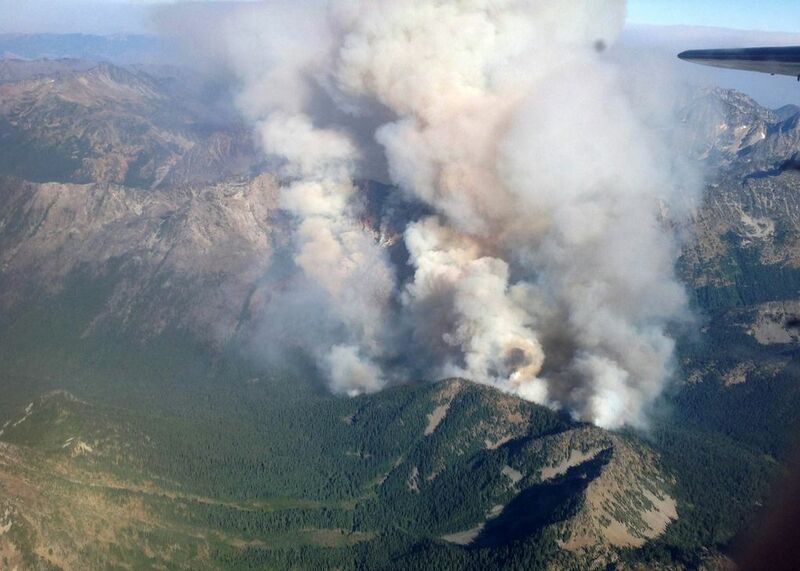 After a summer wildfire scorched a lake in the popular Enchantments area, spring runoff threatened to overwhelm the lake’s dam and flood homes below. The crisis highlighted aging, little-known dams in precious Washington wilderness and shows how climate change could reshape alpine water supplies. ICICLE CREEK, Chelan County — Steve Shipler found the frightening notice last spring, on the door of the house he’d built years ago, in the place he’d loved for nearly half a century, where running water lulls him to sleep and ponderosa pines scent the morning breeze. “I didn’t know any dams were up there,” he remembers thinking. 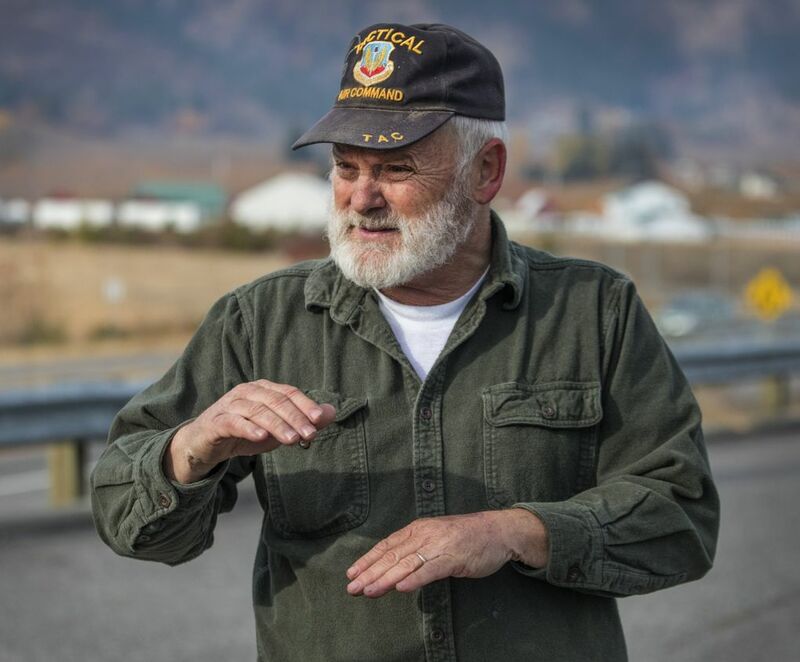 Then, Shipler, 70, imagined a wall of water coursing downstream toward his home, which is perched on an island in the middle of Icicle Creek, only accessible by footbridge. Engineers had modeled a dam breach. Homes near Shipler could have seen a wave of floodwater as tall 15 feet, said Tony Jantzer, the manager of the Icicle & Peshastin Irrigation Districts, which operates the dam. “It would have taken them out,” he said. The threat of flooding brought attention to Eightmile and six other little-known dams nestled within the Alpine Lakes Wilderness, some of Washington’s most precious landscape. The dams are aging, some even crumbling, and they’re ill-equipped for a changing climate. In the future, scientists expect more precipitation to fall as rain, instead of accumulating as snowpack that retains water into hot summer months. That means more water will flow in winter, when it’s not needed, and less in summer, when the requirements of fish, agriculture and nearby residents are acute. There isn’t enough water to go around now, and without updates, there won’t ever be. 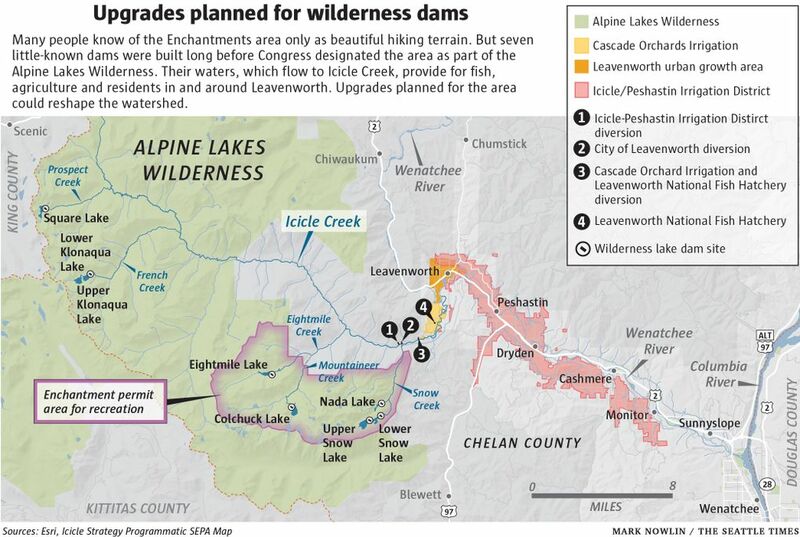 Those updates could reshape the famous Enchantments area. They’ve already forced hard choices that pit wilderness values against preparing for climate change. It took a nearly six-figure helicopter ride for an excavator, some frustrating bureaucratic jujitsu, sleepless nights and lucky weather, but Jantzer and others managed to avert the immediate crisis by modifying the dam before it failed. Now the excavator, marooned amid a dispute over how to get it out, is a symbol itself of the water problems deep in Pacific Northwest wilderness. The trail to Eightmile Lake, on a fall day, winds through a forest of ripening gold and maroon leaves. Slimy mushrooms sprout underfoot. Branches of powder-blue elderberries wilt out of season. Heavy snow will soon cover the trail. Across a valley is Aasgard Pass, a steep gateway through towering peaks to the upper Enchantments, high country rich in granitic stone and dotted with sapphire-blue lakes. The lakes drain into Icicle Creek, which originates some 20 miles northwest of Leavenworth, but is best known for its stretches near the faux-Bavarian township, where ice-cold spring snowmelt crashes over bus-sized boulders. Icicle Creek’s waters provide habitat for endangered salmon and bull trout, power the region’s agriculture and are vital to the city of Leavenworth, where tourists sometimes sip it when they’re not guzzling German beer. 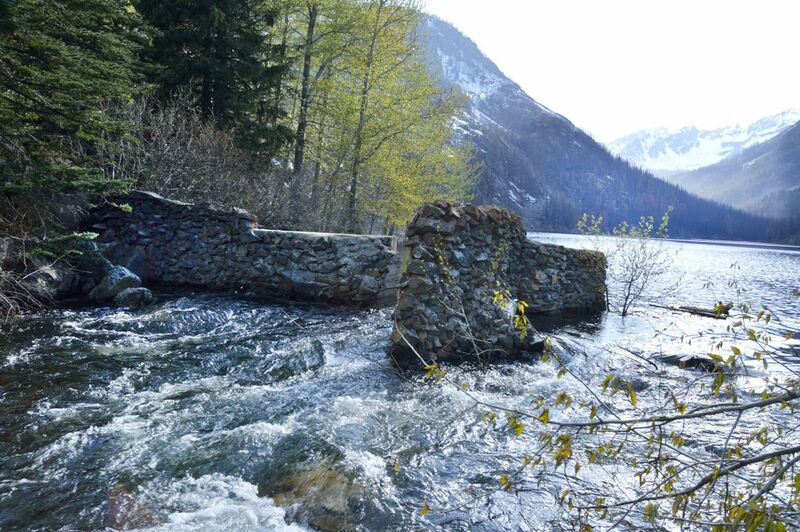 People have harnessed Icicle Creek’s waters for nearly a century with dams. There’s not always been enough to quench the thirst. The Icicle and Peshastin Irrigation districts built the first alpine dams here in the 1920s. In 1927, Leavenworth and several irrigation districts went to court to settle water rights, an indication there wasn’t enough to go around then. By the 1940s, dams had been constructed on Colchuck, Eightmile, Lower Klonaqua, Square, Upper Snow, Lower Snow and Nada lakes. 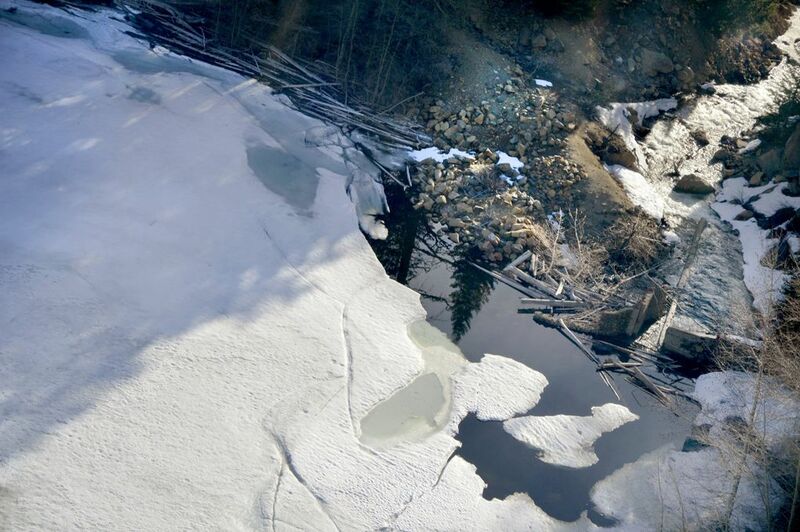 Icicle Creek’s waters have become increasingly important. The federal Bureau of Reclamation in the 1930s built the Grand Coulee Dam, which prevented salmon from migrating past the structure in the Columbia River. Aiming to mitigate the loss of Columbia runs to American Indian tribes that relied on salmon, the government began construction of the Leavenworth National Fish Hatchery, on Icicle Creek, at the decade’s end. As time passed, the lakes that supply the Icicle grew in esteem. Congress in 1964 created the legal concept of wilderness, calling it “untrammeled” earth “where man himself is a visitor who does not remain.” Then, in 1976, Congress passed a bill that designated much of the high country stretching above Leavenworth as part of the Alpine Lakes Wilderness. President Gerald Ford nearly vetoed the bill before a White House visit from then-Washington Gov. Dan Evans, who brought a coffee-table book of landscapes from the alpine lakes. Evans’ meeting was meant to last just a few minutes, but aides couldn’t pull the president away. “He looked through every page,” Evans said of Ford in a recent interview, before deciding any place so beautiful deserved preservation. Common names for features in the Enchantments’ upper basin now, like Aasgard, draw on Norse lore. Its lower basin relies on King Arthur’s Camelot for some namesakes. In recent years, both areas have been mythologized on social media as some of Washington’s most beautiful and popular hiking terrain. It was the Jack Creek wildfire that sparked the dam crisis. The forest blaze two summers ago scorched trees around Eightmile Lake and seared the earth hard. No longer would trees, shrubs and duff soak up precipitation. Instead, water would run down the bowl-shaped basin as if it were concrete. Jantzer, the irrigation manager, began to feel the pressure last February, when the lake was still frozen but predictions about the fire’s effects began to sink in. Engineers predicted runoff could increase as much as 51 percent, according to the Washington Department of Ecology, likely more than the dam could handle. In March, Jantzer began preparing for emergency, and officials identified more than 50 homes and structures that could flood. When he flew over and took photographs in May, Jantzer found 2 feet of water flowing over the earthen portion of the 90-year-old dam. Worried, emergency officials went door-to-door with notices and activated a text-alert warning system. Stress on the dam, and Jantzer, began to mount. He couldn’t sleep. He found himself pacing, fretting. 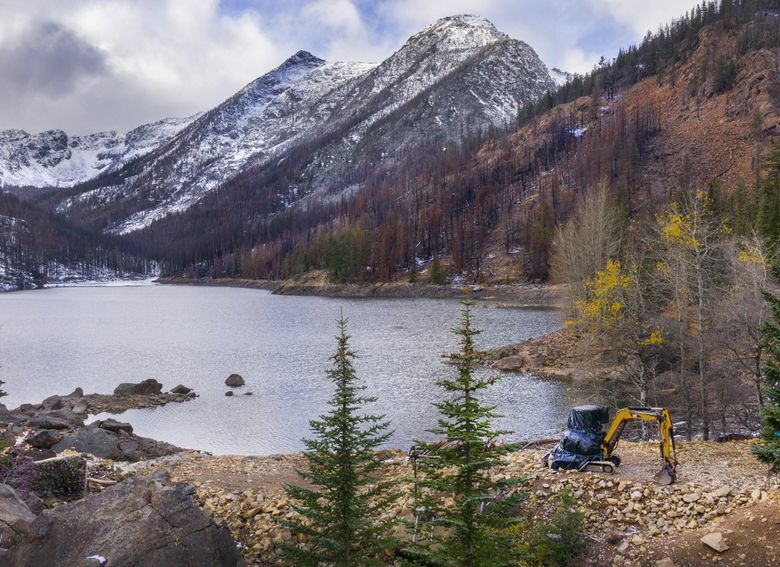 He wanted to drive an excavator three miles through the wilderness to repair the dam as soon as possible, but the Forest Service wouldn’t immediately allow it. He began looking for a helicopter to fly the machine instead, without success. He’s still miffed, and feels the Forest Service made him jump through hoops during crisis. Because the irrigation district has an easement to work on its infrastructure, which was built decades before the Wilderness Act existed, he’s not convinced he needed permission. Finally, he was able to find a helicopter and coordinate with the Forest Service. It cost north of $97,000 — more than 10 percent of the districts’ budgets — to fly the excavator up to the dam, he says. Then, Jantzer’s crew raced to reconstruct and harden the dam, finishing just as rains began. The excavator, a subject of controversy to those dismayed to see machines in the wilderness, remains there to this day. Jantzer wants to drive it out and avoid a nearly six-figure invoice. Forest Service officials want him to apply for a permit. And so, the excavator still sits at lake’s edge, bundled up with a tarp for winter. The emergency repairs could soon be replaced by more-substantial changes. “A lot of the work we did is going to have to be redone,” said Levi Jantzer, the irrigators’ assistant manager, and son of Tony. Jantzer’s irrigation districts are part of a group of government officials, land and water managers, tribes and advocacy organizations, called the Icicle Working Group, that have been working for six years on a plan to reshape the Icicle watershed. There isn’t enough water in Icicle Creek. The flows that crash over boulders in May can become a trickle in August. Wild fish have struggled with low streamflows and warm waters. Harvest of hatchery fish peaked in 2001, to tribal members’ frustration. The hatchery during the 2015 drought had to kill thousands of fish as disease spread, likely a result of waters too warm. Officials also had to ship hundreds of thousands of fish in trucks to another hatchery until the creek’s waters cooled. The hatchery, which still uses some equipment from the 1940s, has struggled to contain pollutants like phosphorus, which decreases the dissolved oxygen in water that fish need to survive. “There’s a maintenance backlog. We have environmental compliance issues,” said Jim Craig, Deputy Complex Manager at the hatchery. The city of Leavenworth, which relies on groundwater in addition to what it pulls from Icicle Creek, does not yet have enough water to meet projected demand in 2050. The seven alpine dams that control releases to the Icicle are so old and remote that someone must hike through steep wilderness terrain to adjust flows by hand. At Eightmile dam, the Jantzers use scuba equipment to dive down and attach a winch to a sluice gate and alter its release. The working group, born out of a tangle of lawsuits over water rights and water quality in Icicle Creek, announced its final, $82 million plan to revamp the watershed earlier this month. Among its projects: Automating the alpine dams to improve streamflow, upgrading the fish hatchery’s infrastructure to recirculate water, improving fish passage, redirecting migrating fish around a boulder field that stops them, and pursuing water conservation projects, like residential leak detection and updated meters. The plan also calls for raising Eightmile Dam several feet, to the height it was before a 1990 flood damaged it. That’s controversial. What the irrigators see as restoration, some environmental groups see as construction. “That would be unprecedented in the national wilderness system,” said Karl Forsgaard, the past president of the Alpine Lakes Protection Society, who is a lawyer and is reviewing the impact statement. The society and other environmental groups, which are not part of the working group, think the irrigation district might have relinquished some of its right to Eightmile’s waters, under Washington law, by not restoring the dam’s height sooner. Tony Jantzer disagrees. Forsgaard also perceives the irrigators, with their excavator, and the leaders of the working group, as callous toward wilderness laws. Jantzer said he’s not cavalier about his districts’ obligations to wilderness, and believes his districts have the legal right to access their dams. He also contends that an excavator would leave a less noticeable mark on the wilderness than other equipment. 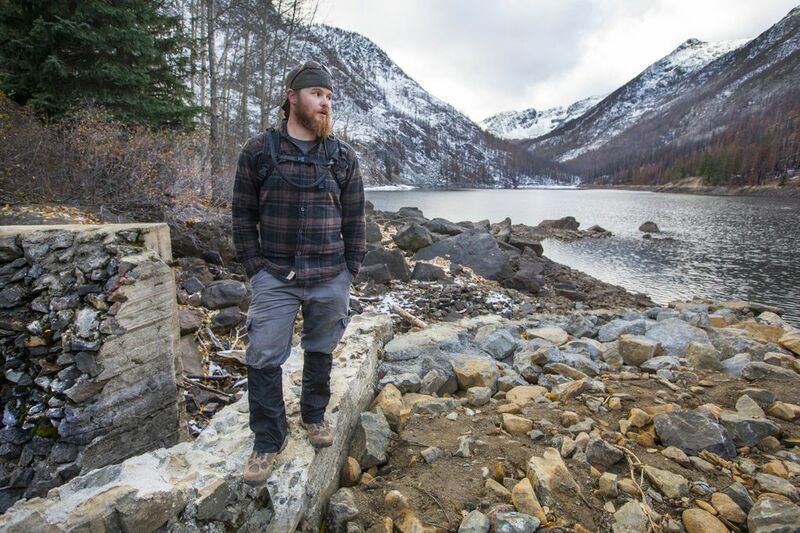 “We try to do things with the minimum tools we possibly can, but if you’re going to replace a dam, it’s more than I can do with a shovel,” he said. Climate change can be vexing and complicated, but its effect on the Icicle watershed can be boiled down simply: More rain, less snow, according to a report by the University of Washington’s Climate Impacts Group. The scientists predict more water will flow in winter, and the snowpack won’t last as long in summer. Seasons will likely shift. Drought years, like 2015, could become more common as temperatures rise. As the working group planned its projects, it needed to ensure they would “not be eroded by climate change,” said Dan Haller, a consultant on the project. “We’d hate to invest $100 million in a suite of projects and then 20 or 50 years from now find they’re underperforming” he said. Before selecting a final plan, the working group pitched several draft options, including some that were more aggressive in preparing for rising temperatures. One proposal called for raising dams on Upper and Lower Snow Lakes by 5 feet, raising Eightmile dam another 11 feet and tunneling, siphoning or pumping water between Upper and Lower Klonaqua lakes to increase their storage capacity, so water managers would be less reliant on snowpack during droughts. Another option called for an electric pump system to draw irrigation water from the Wenatchee River, where Icicle Creek ultimately flows. The system would have allowed water to bypass irrigation diversions on Icicle Creek, aiding fish along its entire length, then flow into the Wenatchee, where it would be pumped uphill to irrigate orchards. The plan would have cost an estimated $177 million. The irrigation districts favored expanding the lakes. “Water storage is going to be paramount. If climate change hits the way it’s forecast to hit, there are going to a be a lot of places in the West that will have inadequate water supplies,” Jantzer said. Some environmental groups favored the pump system, despite the extra expense. “We need to find solutions that don’t sacrifice wilderness for water,” said Kitty Craig of the Wilderness Society, adding that building brand-new infrastructure in wilderness was illegal. Still, like Jantzer, she wonders if the working group will have done enough, as climate change looms. “Some would say we’re not doing enough to make sure there’s still enough water in the stream for fish in 2050 and 2070 and beyond,” Craig said. As we peer into our climate future, these are some of the murky choices we face. Flood portions of a wilderness area to store more water and help fish? Build an expensive and power-intensive pumping system instead? Is it still a wilderness if humans build or restore dams there? In our lifetimes, with human-caused warming, by what definition, other than legal, was it wilderness at all? “Climate change really exacerbates and makes it absolutely clear: The concept of naturalness is really a pipe dream we can’t reach and it’s not even clear what it means anymore,” said David Cole, Scientist Emeritus at the Aldo Leopold Wilderness Research Institute. In its 1964 act, Congress didn’t contemplate climate change, but left “wilderness character” as its guide, Cole said. There are two main theories of reckoning, he said. Some advocate we keep hands off, and let nature, and warming, take its course, because we don’t know best. Others think people ought to intervene on a case-by-case basis, when the benefits of intervention to wilderness — saving trees from invasive bark beetles, for example — justify the trammeling that must take place. As dams crumble, salmon languish and the needs of orchards persist, the decision has been made to intervene, and it will reshape the Icicle watershed. Will it reshape how we think of wilderness, too? Correction: Icicle Creek originates northwest of Leavenworth, not northeast of the town as stated in the 18th paragraph of an earlier version of this story.